The central question of this year’s election is whether the HDP can muster enough votes it needs before it can win any seats. As we have previously reported, the party is going need around 4.5 million votes to ensure it crosses the national threshold and enters parliament. Any fewer, and it risks falling short of 10% and winning no seats at all. And it does happen. We only need to roll back 13 years for a Turkish election when a party got agonising close to crossing the threshold, but ultimately fell short. Remember 2002? That was the one that catapulted the fledgling AK Party to power in a landslide election and placed only the CHP in opposition against it. 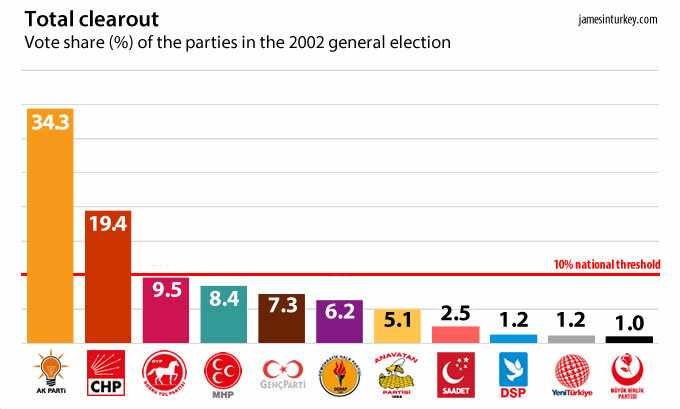 It was also a real bloodbath for the parties in the outgoing government: the nationalist MHP and centre-right ANAP took 8.4% and 5.1% respectively, while the centre-left DSP – which had led the coalition – finished the night with a miserable 1.2%. The centre-right True Path Party (DYP) fared better than other mainstream parties, in part because it had been in opposition for five years. But its 3 million votes clocked in at 9.55% – not enough to get it over the threshold. This is the plain cruelty of Turkey’s electoral system. The DYP under Tansu Çiller got agonisingly close: just 158,000 more votes would have done the trick. That means that if barely 2000 more people supported it in each of Turkey’s 85 districts, the DYP would have been in parliament with dozens of seats. Instead, it got none. This is the danger facing the pro-Kurdish HDP today. Like the HDP today, the DYP had a strong regional base to rely on, albeit in a different part of the country. Western provinces were where the DYP did well in 2002, particularly among conservative voters who were angry at the government but suspicious of the AK Party’s religious tendencies. 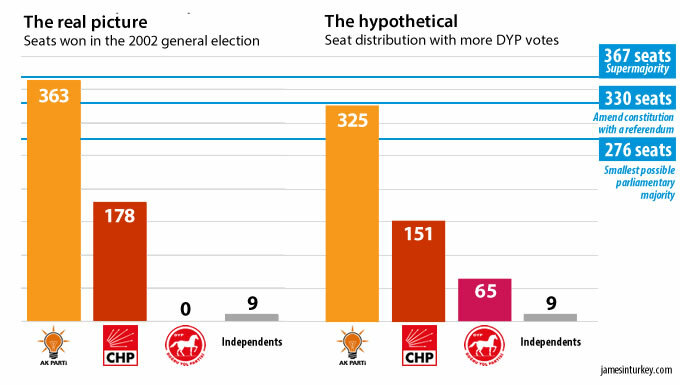 The DYP also won a decent spread of votes around the country, a key HDP objective for this year. This meant Mrs Çiller was able to pick up single seats from a scattering of small, rural provinces. It was a solid foundation of support around the country. All the DYP needed was liquidity – votes, and votes from anywhere. 158,000 more of them would have created a 65-seat DYP group in parliament. 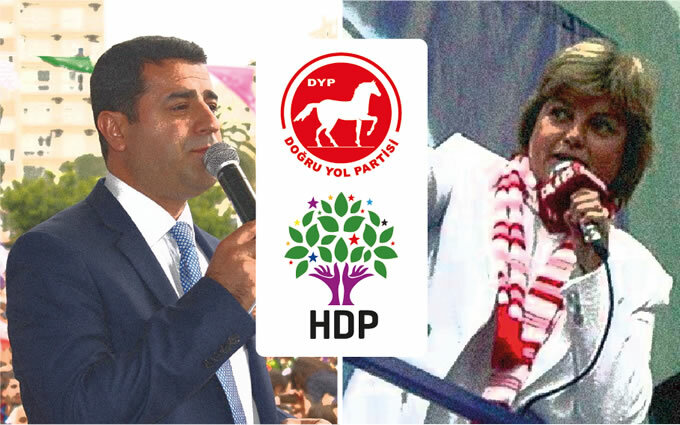 The HDP could lose everything by an even narrower margin. Naturally, the parliament elected in 2002 would have looked quite different if a DYP contingent was added to the mix. The AK Party would still have had a large majority – 49 seats, rather than 87 – allowing to comfortably govern alone. But the arithmetic would have been quite different: this AK Party would not have been able to call on a referendum on its plans to directly elect the president, for example. Today’s HDP has several advantages over the DYP in 2002, though. First, 2002 was a landslide election when voters punished all the mainstream parties, including the DYP. No such dramatic swings are expected this year. Second, support for Mrs Çiller’s party had crashed in Turkey’s largest cities: it took less than 3.5% of the vote in Istanbul, 5.5% in Ankara and 9% in Izmir. The HDP can expect to do better in them. Third, this is the first time overseas voters can influence a Turkish election in significant numbers. The HDP has a network of European campaign staff and can rely on thousands of expatriate voters, who could tip them over the threshold. The DYP had no such head start.